Although they look very simple, they have surprisingly far-reaching implications, usually in conjunction with the Law of Unintended Consequences and with systems theory. Often, a trivial-looking decision has consequences that are unwelcome and unexpected. Early sociotechnical work by researchers at the Tavistock Institute included a classic study showing why introducing a new and apparently more efficient technology into coal mining had serious negative effects on the social structures involved in how the miners worked. This had huge practical implications, which was why the Tavistock Institute became involved. A more recent example, examined in this article, is that the form of technology being used in education has major sociotechnical implications. These implications are easily missed, because they are so familiar that they are usually taken for granted as being inevitable parts of the education process. I’ll start with a classic example. The image below shows two technologies whose social consequences were far reaching and unexpected. If you were an educated woman in early nineteenth century Europe or North America, your career options were extremely limited. You could do poorly paid manual work, or you could be a teacher or governess; for anything else, in an age before equal opportunities legislation, your chances of getting into a respectable profession were negligible. That changed with the invention of the typewriter. Mechanical typewriters had commercial advantages over pens, and were rapidly adopted by businesses. This led to a demand for large numbers of literate staff to operate the typewriters. Businesses could pay women less than men for doing the same work, so the female typist soon became a familiar figure in offices. This meant that an educated woman could become financially independent doing a respectable job, as a result of the invention of the typewriter. This change coincided with another technical innovation, namely the development of bicycles. A woman could use a bicycle as a way of getting to and from work, which opened more opportunities – for instance, being able to work somewhere that didn’t have good public transport connections, while living away from the workplace in a place of her choice, rather than having to live in workplace acccommodation or with her parents. The combination of these two technological developments paved the way for women’s emancipation, and a wide range of other social changes that were probably neither expected nor intended by the inventors. A third major technological factor with dramatic implications for women’s emancipation arose from the opposite direction, in sociotechnical terms. 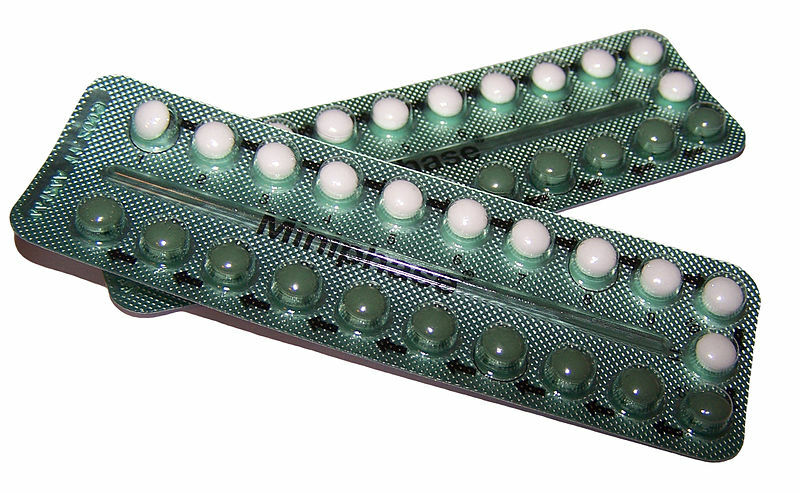 The oral contraceptive pill was invented as a result of planned research, when the society involved was favourable to the idea. It was an example of social pressures driving technology, rather than vice versa. Once you’re aware of sociotechnical issues, you realise that they occur in a huge number of places, and that their effects often reach surprisingly far reaching. Here’s an example. 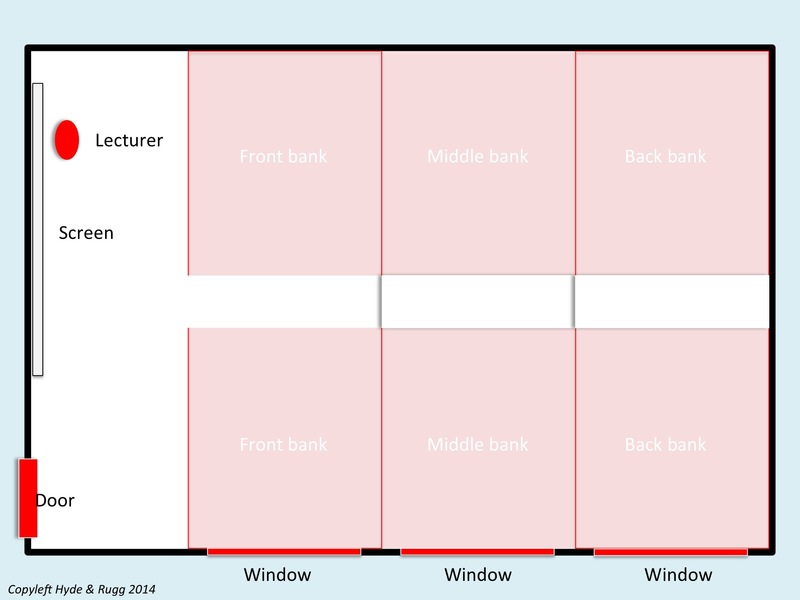 It’s a diagram showing the layout of a classic university lecture theatre. It’s a rectangular room, with a presentation screen at one end, and three banks of seats, rising toward the back. There’s an aisle down the middle of the seats. There are three windows. The students sit in the seats; the lecturer stands at the front. So where does sociotechnological analysis come in? For a start, there’s the layout of the room. The seating all faces front, towards the lecturer and the screen. The students have no control over the location of the seats or over the direction in which the seats face. That makes small group work difficult, and biases the room towards traditional lectures. Other implications become clearer when we look at the same room layout schematically, in terms of where things are happening. At the start of the lecture, there are people coming through the door, and there are people taking seats, and there are people visible through the windows. I’ve shown this in red in the image below. The seats’ layout means that the audience can’t see each other very well – they can usually only see profiles or the backs of heads. I’ve shown the seats in light red, to correspond with this restriction in information. I’ve used dark red for the more interesting places, where the audience can see people moving about – the door, the windows, and the lecturer. Most of the room is either light or dark red, with something happening. 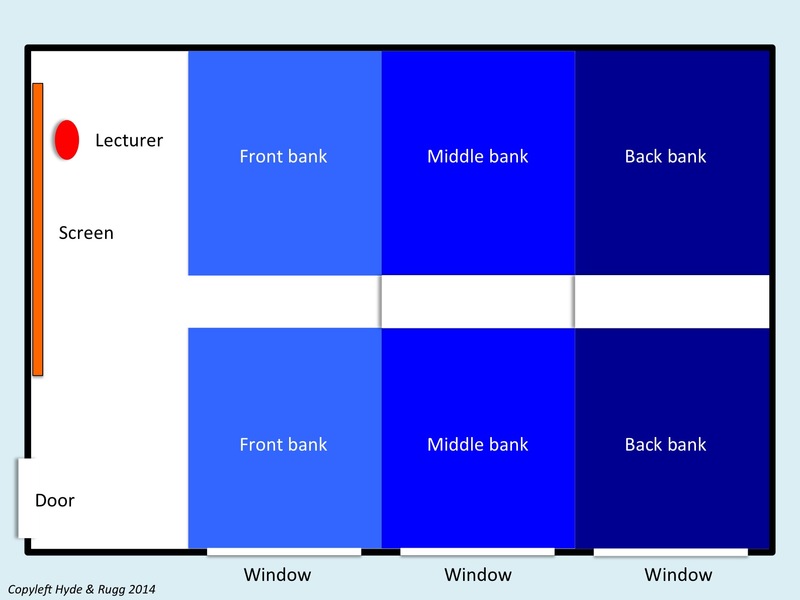 Here, as a contrast, is a schematic image of the same room during a typical lecture, when the window blinds are closed, the lights are down, and there’s a PowerPoint presentation on the screen. The audience can dimly see each other, and they can see the lecturer, and they can see the screen, which will typically have about seven bullet points on it, each consisting of a few words. It’s an exercise in sustained sensory deprivation, where the only significant sensory input is completely under the control of the lecturer. In social terms, there are a lot of issues about social power and constraint built into the layout of this room. There are also a lot of sensory input issues that are just asking for trouble, even with university students. With younger school pupils, particularly any who have issues about sensory loading, such as children with ADHD, this layout is going to generate significant problems, and will almost certainly lead to discipline issues when those children start trying to redress the sensory underload by fidgeting or moving about. Here, in contrast, is a thought experiment showing how a different technology would have very different implications. 3D hologram technology isn’t far away from being feasible. Imagine that 3D hologram projectors are a practical, affordable, everyday technology. 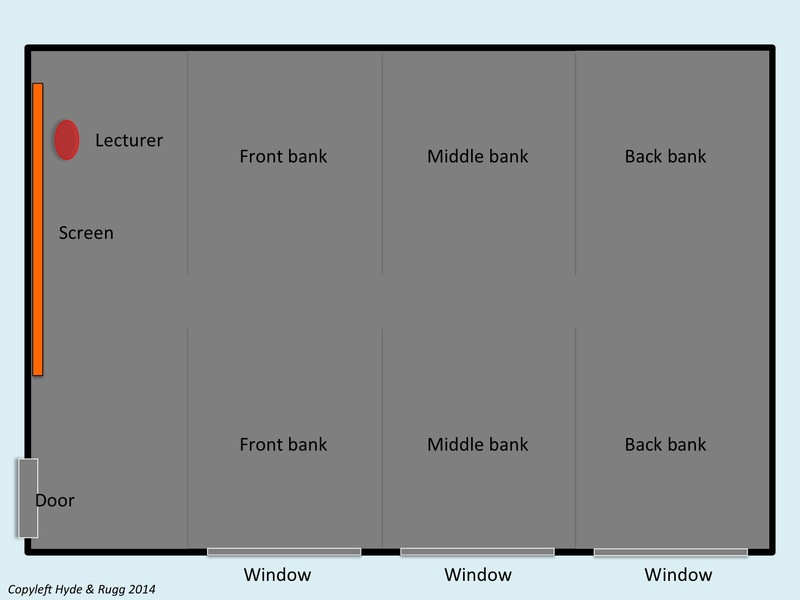 What effect would they have on the layout of a lecture theatre and on the power relationships built into it? The room would probably be centred around the place where the hologram appeared – the green circle with an “H” in the middle of the image below. Because the image is three dimensional, the best arrangement for the students would be to have a walkway around the green hologram screen in the centre. This would let students walk around the image at a speed of their choice. 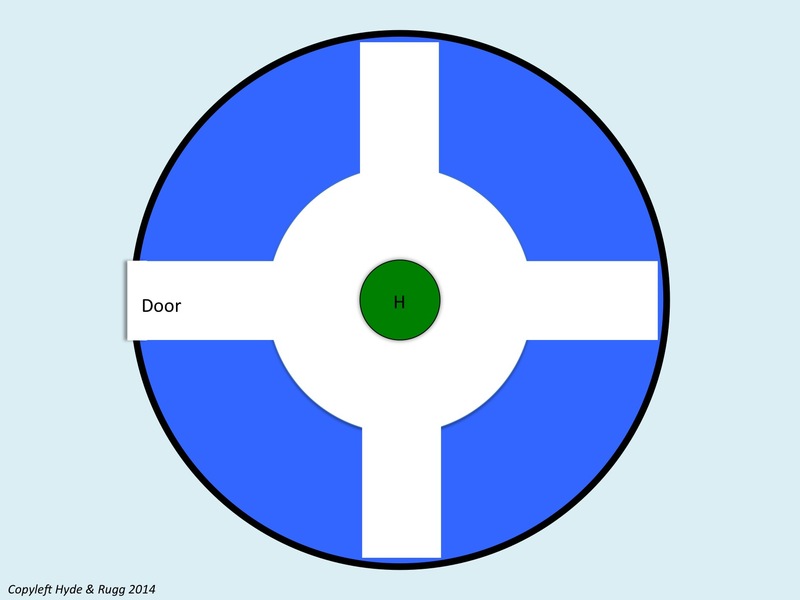 The seating would then need to surround the walkway (the blue quadrants in the image). For most efficient use of space, the room would be circular, which raises interesting architectural challenges about use of space; one possible alternative would be to have hexagonal rooms rather than circular, but that’s another story for another article. This is a very, very different layout from the previous one. There’s also an unanswered question about the power relationships implicit in the layout. Where does the lecturer fit in this schema? In the previous layout, the lecturer stood next to the screen, sharing the privileged position with the screen, facing the audience. In this new circular layout, the lecturer can’t face everyone at once. It’s an issue familiar to the world of live theatre and live music performance, but less familiar to the world of education. This layout biases the power relationship towards the lecturer being a facilitator and helper for the students, rather than the lecturer as someone who controls the students. That’s very different from the usual power relationship in taught education, but quite similar to the power relationship in a research degree – one of the many places where universities are different from other places of education. There are similar sociotechnical issues about the use of new technology, where the layout of the room, and the layout of the screens and keyboards and other equipment, all have significant implications for power relationships and social interactions and sensory load. This in turn has economic and political implications about the feasibility of education delivery via a significant IT component, and about attempts to standardise qualifications across international boundaries. We’ll examine some of these issues in later articles. I’ll also blog soon about STROBE, a technique for analysing use of space systematically with regard to these issues. This entry was posted in design, education theory, requirements and tagged power relationships, room layout by hydeandrugg. Bookmark the permalink.